Snuggle up and choose your next adventure in P.J.’s Place, a cozy reading nook filled with age-appropriate books and comfortable seating for all ages. Power of Play: Reading is fundamental in academic, communicative and creative development. Reading together is a nurturing activity that builds closer relationships and develops a thirst for knowledge. Playful Tip: As you read together, ask your child to point out familiar letters or sounds. Boost comprehension skills by encouraging your child to retell the story. 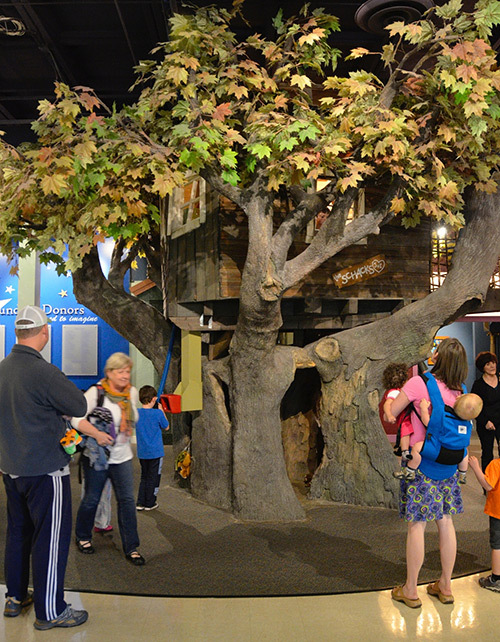 Enjoy a bird’s eye view of Imagine inside a treehouse! 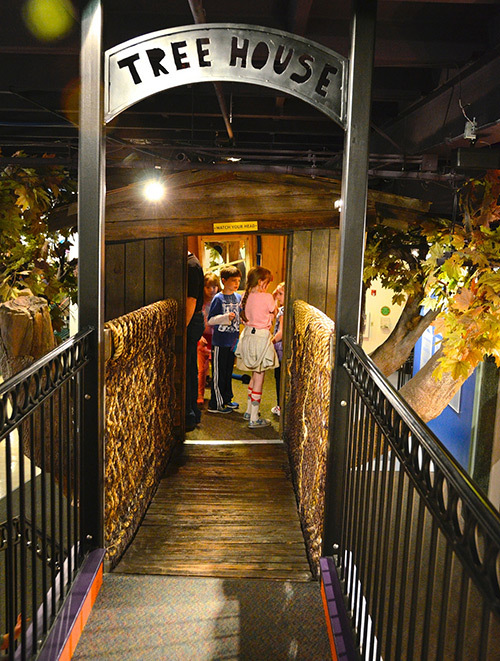 Venture inside at ground level and host a puppet show with forest critters. A hop, skip and jump across a suspension bridge takes you inside the treetop where you can peek at friends below through a periscope. The Treehouse, carved by local craftsmen from a 100 year-old Ebey Island home, stands as a handsome focal point visible from the entrance of Imagine. Power of Play: Imaginative play and curiosity come alive inside the ultimate treehouse! Children connect with nature and learn the power of exploring the world from a different perspective. Playful Tip: Read signs in the treetop about birds and insects you might see in your own backyard. Grab a “talking tube” and say hello. Does anybody answer?